Beads to be woven into the hair for those that dread their follicles to a cord or used as dangles for woven rope or strings. Skull beads as charms for bracelets, necklaces and placed on their drums and other items. Attempting to be a versatile as possible, I have also created the Skull Chain: loops on each end that are then chained together for bracelets, necklaces, earrings and more. 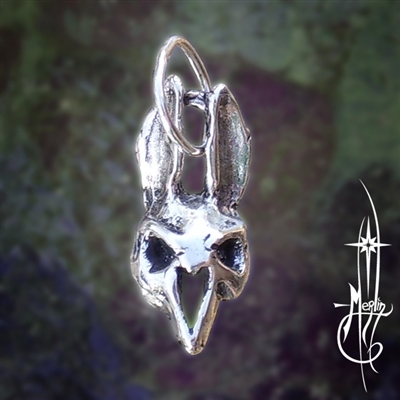 For those who are more of a different look, I also make a Bunny Skull. Skull money clips! One is simply a skull; other versions include stones in the eyes and a Jolly Roger: the skull with crossed swords. Each with a working jaw, spring loaded ready to hold your cash; I carry one myself and enjoy it immensely. Seldom one finds a fierce image of the Rabbit. sometimes advising him on a number of matters. know they can have a somewhat darker streak. is so profoundly formidable Sir Robin soils his armor. by decapitating hims with his terrible teeth! appearing as a huge beast in times of darkness and fear. and where hi might find them. who rises above the illusions of Being. a transcendent being representing a host of virtues and innocence. direct descendant of the Rabbit of Caerbannog. for those lovers of skull jewelry. Merlin and Z Collaborate on Skull Ring Designs! Some time ago M’Lady received (as a gift) a special Leather Jacket designed by Soeren Joensson or “Z” as his friend call him. The design was unlike anything I had ever seen. Instead of the typical cuts which make a jacket, the materials were cobbled together into a very unique pattern. It had loops all over it. Years after she received it, I made for her a series of clasps made of dragons: interlocking, solid rings of scales and teeth, wings which hooked into each other and the leather loops in which they were intertwined. Upon several occasions, M’Lady was complemented, stalked and even assaulted to get the jacket and it’s hardware. Finely, at a Drum Circle the jacket was stolen off the chair where she was sitting: we found it weeks later: stripped of it’s sterling and left in a heap. Again I looked at the jacket and considered: what an honor it would be to be able to collaborate with Z. A few years ago I was introduced to him through a good friend: Luna Shimada. Z is a force unto himself: For over 20 years he has produced leather and jewelry for bikers and rock musicians such as Ozzy Osborne and the Foo fighters. Other clients include J Leno, Cher and Dirk Losander. Z’s line of “Illegal Luxury Leather” is beautiful: skirts, jackets, vests corsets and more. Be sure to check out his website! It includes everything from T shirts to intense coats. Over the past several years Z and I worked on several designs: pendants, rings, buttons and other ideas. Recently we settled on releasing our first piece: the Z-Skull Ring. The Skull Ring seems to change it’s mass: when you hold it in your hand the Ring feels very heavy, when you wear it the ring feels light. Deep set eyes in a very realistic skull which includes the famous “Z” logo in the temples and inside the ring itself (accompanying the “Merlin” logo!). 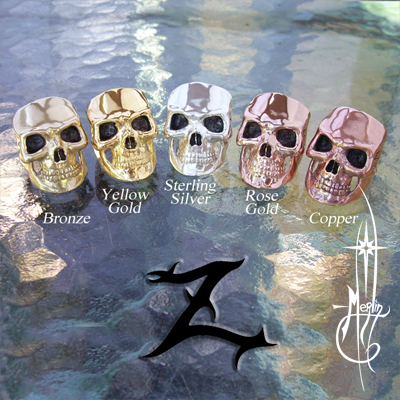 The new Skull Rings now available in Copper, Bronze, Sterling silver. Each ring is hand made (my hands! ), not mass produced: rare and carefully crafted especially for Z. Now available only in a select store in Las Vegas and through the Friends of the Desert Pyrate! When many people see skulls in flags, posters or what not they either think of Halloween or pirates. The United States tend to categorize Skull “anything” as spooky. Not so! Skulls are being found on everything from bandannas to Hawaiian shirts. In Mexico Skulls are a part of religious holidays honoring their ancestors. After only a second’s hesitation, I decided to give the image a go myself. In fact on of the very first pieces of sculpture was a skull, back in my preteen days. What started out as a Halloween thing ( yes, I live in the States) turned out to be a study in the shape of the head, proportions of the face and a good familiarity of how a portrait is put together. My Mother (a collage level art instructor and founder of the McLaren Studio Academy) took the opportunity to point out the connective tissues, the way the muscles are aligned and how expression is developed with the foundation of the essential bones. Now that I am making jewelry and sculpture professionally, I have developed an entire line of jewelry based on the Skull. So far I have created Skull beads that can be woven into the hair for those that dread their follicles to a cord, or used as dangles for woven rope or strings. I have seen folks use the skull beads as charms for bracelets, necklaces and charms placed on their drums and other items. Attempting to be a versatile as possible, I have also created the Skull chain: loops on each end that are then chained together for bracelets, necklaces, earrings and more. Z and Merlin Collaborate on Skull Ring Designs! Over the past several years Z and I worked on several designs: pendants, rings, buttons and other ideas. Recently we settled on releasing our first piece: the Z-Skull Ring. The Skull Ring seems to change it’s mass: when you hold it in your hand the Ring feels very heavy, when you wear it the ring feels light. Deep set eyes in a very realistic skull which includes the famous “Z” logo in the temples and inside the ring itself (accompanying the “Merlin” logo!). The new Skull Rings now available in Copper, Bronze, Sterling silver; also now available: clad in 18k Yellow gold and a deep rich 14k Rose Gold. Each ring is hand made (my hands! ), not mass produced: rare and carefully crafted especially for Z. This Classic Skull Money Clip is a deep carving which will easily fit into your pocket and a fully articulated jaw to bite those bills! 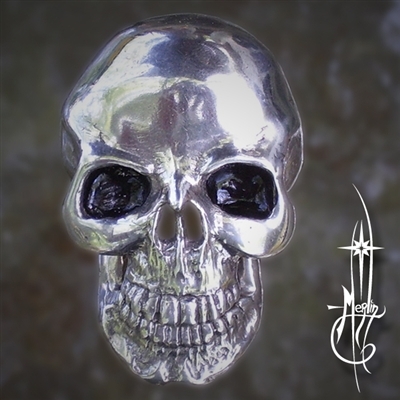 This is a perfect gift for those who are collectors of the skull in jewelry and decor. Your bank roll is protected by the ancestors! Perfect for Bikers, Goth enthusiasts and Medical Students. As with all of Merlin’s creations, these are not mass produced: each one is made as they are ordered and can be modified with your symbol or logo on the forehead (custom fees may apply). To see and learn more or order yours, please visit the web page in my site for more details about the Skull Money Clip “here”.